Caravan Guard are proud to once again be supporting the Great Yorkshire Bike Ride. 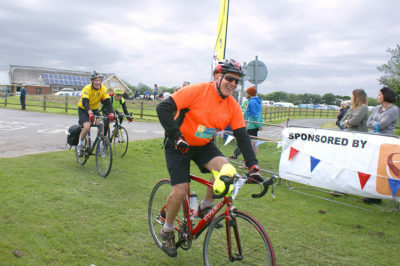 We have a team of 11 in training for the charity cycle ride in a bid to raise up to £10,000 for lots of great charities. Plus, we’re also helping the event organisers with sponsorship so they can put on the ride. And it’s an extra special year for our chairman Peter Wilby, who is gearing up for his 25th ride! The gruelling 70-mile bike ride takes place on Saturday, June 15th, starting at Wetherby racecourse, making its way across the Yorkshire Wolds to the coastal town of Filey. Caravan Guard’s pedal power has raised more than £53,000 over the last six years, and we’ve regularly won the team award for raising the most money for charity, supporting our company value “care completely”. Now in its 36th year, the Great Yorkshire Bike Ride has raised an incredible £2.8 million for many Yorkshire-based charities, including Heart Research UK, Yorkshire Cancer Research, Epilepsy Research UK, Candlelighters Trust and Ryedale MENCAP. If you’d like to sponsor our team visit our fundraising page to donate.